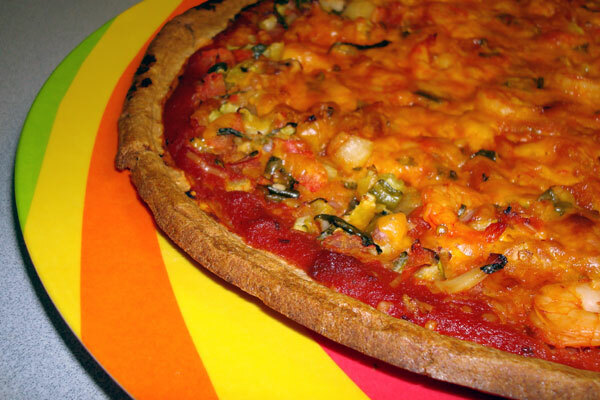 I’ve been experimenting with various whole wheat crust pizzas. Up to now, I’ve only used Trader Joe’s refrigerated Almost Whole Wheat Pizza Dough. It’s been okay. The flavor is good, but it’s difficult to get it as flat and even as I’d like. My results have been inconsistent. This weekend, the BF and I popped into Whole Foods and discovered their 365 brand of pre-baked whole wheat pizza crust. What a find! The calories are a bit less than Trader Joe’s dough, and the crust is thin and even. It takes some of the artisanal quality out of the end product, but it’s worth it for the consistency. The first one I made was a standard cheese and pepperoni, using finely shredded mozzarella and turkey pepperoni. This was the second one. It was yum-o-licious! Lightly mist pre-baked crust with olive oil spray. Evenly spoon spaghetti sauce over crust. Evenly sprinkle cheeses over sauce and crust. 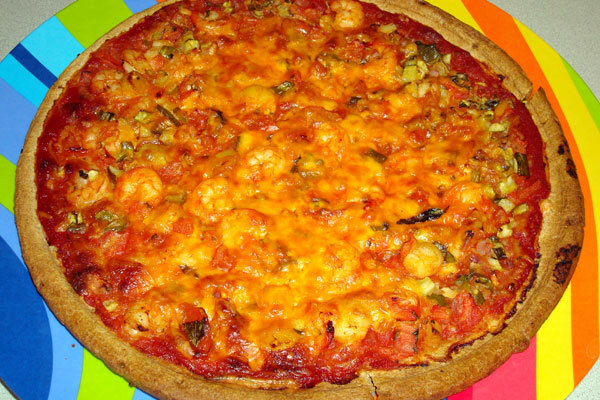 Arrange shrimp and scallop mixture on top of cheese. Entry filed under: clean eating, food review. Tags: healthier fast food, healthier pizza.